ITS Logistics | Noble Studios, Inc.
From the beginning, ITS Logistics has prided itself on being a small, locally owned business. Since its debut in 1999, ITS has provided customers creative solutions for all of their logistics needs including expedited fleet, warehousing and distribution services as well as nationwide multi-modal freight brokerage. It is, in other words, so much more than just a trucking company. Over the course of three years, ITS nearly tripled in size, driving home the need for a comprehensive marketing strategy. They turned to Noble Studios for our expertise in digital design and development. Our mission was to help them make sense of and manage the chaos that usually accompanies the sort of professional growth spurt they’d experienced. ITS sought a new website along with a broader digital marketing strategy that would help support the company’s vision as it continued to grow. The site would serve the twin purposes of attracting both new clients across the West and potential new employees. Starting with a 360-degree strategic overview, Noble Studios dug into ITS’s web analytics, SEO and social media performance. 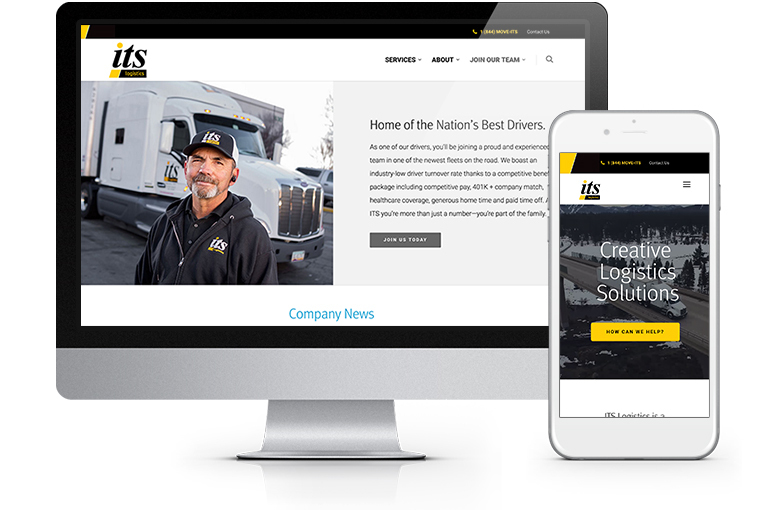 Add in a brand refresh as well as a complete website overhaul, and ITS Logistics was well on its way to becoming a national competitor in the third-party logistics space. Providing a fresh look that reflected the company’s growth, without losing valuable name recognition, Noble first undertook a brand refresh. The result was a grounded logotype, modern typography and a refreshed color palette which elevated the already trusted, unified brand. With increased legibility and consistency, ITS’s logotype is now easily recognizable from afar and while on the move. The refreshed ITS brand reflects the company’s forward-thinking approach to creative logistics solutions. Noble Studios developed a design system that represents movement and communicates trust. Noble added depth to the brand by introducing a secondary color palette which complimented ITS’s primary colors. We performed a complete overhaul of ITS’s website, showcasing the value of the company’s multi-faceted and customizable service offerings through bolder design elements. One of the most visible examples of this is a series of videos placed throughout the site. With designs under way, we performed extensive keyword research to determine the top words and phrases that would best speak to ITS’ position as a leader in the logistics world. Using our SEO strategy, we boosted ITS’ search rankings and provided critical information for companies considering ITS to handle their valuable cargo. We created a series of evergreen pages outlining the company’s services to explain how its personalized supply chain solutions work. We anticipated the needs of potential clients by providing information on specific services such as expedited transportation as well as custom logistics solutions. The result is a site that is poised to attract even more potential customers through organic search. Since its launch, ITS’s website has seen a significant boost in mobile sessions as well as pages viewed per session by returning visitors and average session duration.